All entrepreneurs and business leaders face similar frustrations--personnel conflict, profit woes, and inadequate growth. Decisions never seem to get made, or, once made, fail to be properly implemented. But there is a solution. It's not complicated or theoretical.The Entrepreneurial Operating System(R) is a practical method for achieving the business success you have always envisioned. More than 2,000 companies have discovered what EOS can do. 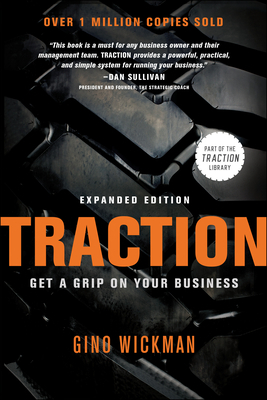 In Traction, you'll learn the secrets of strengthening the six key components of your business. You'll discover simple yet powerful ways to run your company that will give you and your leadership team more focus, more growth, and more enjoyment. Successful companies are applying Traction every day to run profitable, frustration-free businesses--and you can too. Gino Wickman's passion is helping people get what they want from their businesses. To fulfill that passion, Wickman created the Entrepreneurial Operating System (EOS)(R), a holistic system that, when implemented in an organization, helps leaders run better businesses, get better control, have better life balance, and gain more traction; with the entire organization advancing together as a healthy, functional and cohesive team. Wickman spends most of his time as an EOS Implementer, working hands-on with the leadership teams of entrepreneurial companies to help them fully implement EOS in their organizations. He is the founder of EOS Worldwide, a growing organization of successful entrepreneurs from a variety of business backgrounds collaborating as certified EOS Implementers to help people throughout the world to experience all the organizational and personal benefits of implementing EOS. He also delivers workshops and keynote addresses.